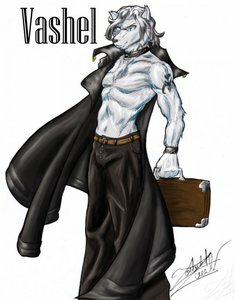 Hello there I am Vash or Vashel if you wish, I am bisexual if you wish to wonder my sexual pref. Some people wonder what I am, who I am, etc. Well this can be answered easy enough by simply talking to me and getting to know me, just drop me a PM, I don't bite. I do Role-play and I role-play several ways. I do Scifi, fantasy, realistic, you name it, if you want to RP with me just PM me and I'll drop you my Skype, Second Life, or we can do it here. I do have some ground rules when it comes to role-play though, but I'll tell you that once you wish to initiate RP. For the time being I am a simple Dire Wolf who just goes about life seeking out adventure, offline. But like I've said, you wanna get to know me, just PM me. Oo-Rah to Ashes.